You have to admit there’s not too many bands named after heavy road vehicles. Buffalo Springfield were apparently inspired by a steam roller and it didn’t seem to hamper their progress. Here we have a crew from Seattle who maybe think that a tractor company (although they miss out an “e”) will draw folk in, at the very least it’s a memorable name and should avoid the harhums and ‘ums that often accompany a momentary lapse of memory when telling a pal about this great new band. 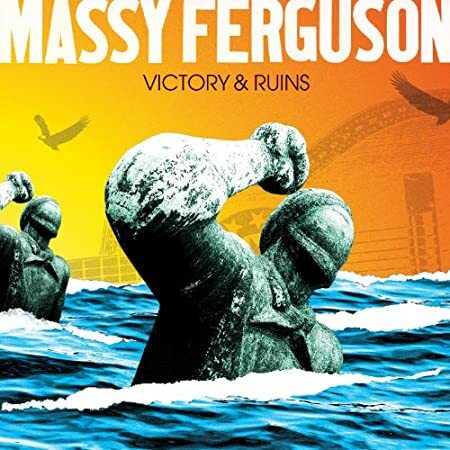 While great might be too over the top to describe Massy Ferguson (and they’re not particularly new) it’s fair to say that Victory & Ruins is as fine a slice of rip roaring rootsy Americana rock as I’ve heard in some time. With a classic four piece line up (Ethan Anderson, bass and lead vocals, Dave Goedde, drums, Adam Monda, guitar and backup vocals and Tony Mann on keyboards) they aren’t the most original band around but then neither were The Blasters. What matters is that Victory & Ruins is one of those albums that you can whip out and play when someone asks you to define American roots rock. With elements of The Drive By Truckers, Son Volt, The Jayhawks, Bottle Rockets and others all cramped in the driver’s cab they set out to harvest some prime roots music pausing briefly to pick up additional passengers including Jason Kardong whose pedal steel sweetens several of the songs and Zoe Muth who delivers a very fine vocal on The Hard Way. The album opens with the jackhammer guitar and drums of Hello, a song that harks back to snappy power pop times with arm punching precision, a great chorus and a pile driving finish. Renegade however trumps this with its flowing country rock feel, the percussion lighter and the guitars rippling on a song that’s not too far removed from local heroes The Wynntown Marshals. 2 AM Beauty Queen continues in this vein with a harder edge and again the Marshals come to mind with Anderson’s voice capturing that slightly hoarse, slightly worn at the edges, dusty delivery. Here the band do deserve to be called great as the barrelling guitars and organ drive the song while there’s a tremendous dynamic with lulls in the musical maelstrom allowing Anderson to ponder on the rights and wrongs of falling for the titular beauty. Everything’s Done is a hard luck tale with a bold palette as the organ swirls throughout, the bass burbles and the guitars slowly burn while Goedde adds the most sympathetic cowbell heard in some time. Zoe Muth steps to the front to duet on The Hard Way, a very fine country piece that lopes along with gliding pedal steel guaranteed to melt the heart of cosmic cowboys everywhere. The band visit DBT territory with the rambunctious Flexed-Arm Hang but the following songs (Compromised Intelligence and Wait Love Maybe) lack the bite of their predecessors. The Beatles’ like opening chords of Labour In Vain however has the band back in full swagger with clarion guitar ringing away as they mix Tom Petty, The Byrds and The Truckers in equal doses. Apartment Downtown departs from the template with a cello adding a sonorous depth to this tender love song while they lower the curtain with the sweet and sour melancholic country rock sweep of Bring Back Something, a fine end to a very fine album. 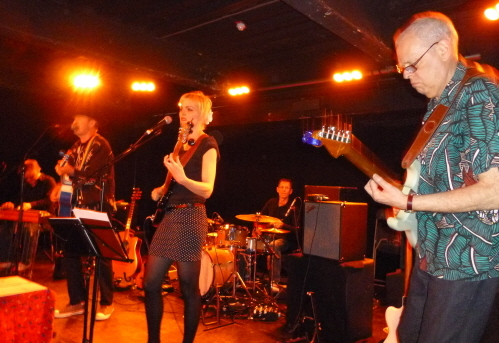 Good news, Massy Ferguson are touring here next month, bad news, no Scottish dates. However on the strength of this they are well worth seeing. Yes Please has been available for a while but it’s getting a push on the back of The Bills‘ current UK tour which takes in several Scottish dates starting next week. A Canadian export, The Bills are Juno winning artists in their homeland but have a fairly low profile overseas and it appears that Yes Please is their first album in almost eight years. So what to expect? Simplest comparison I can make at present is with Brighton’s Mountain Firework Company who travel along similar lines. There’s a fine thrust to many of the songs with fiddle and mandolin well to the fore as singer Chris Frye drives the songs forward. The opener Hallowed Hall is a fine example while Not the End and The Plant Song sound like they could be audience pleasers while Shining Face is a powerful piece with a surging fiddle and accordion led accompaniment. There’s a wide range of influences on show here and plenty of space for the band to show off their instrumental prowess with five instrumentals on the album. While at heart they’re a folk rock band they take in swing jazz (covering a Django Reinhardt tune, Love’s Melody), tango (Scotch Bonnet), Eastern influences (Gale In My Sail), bluegrass (Blackberry Ivy and Broom) and there’s an undoubted Celtic influence in the fiddle tune After Music. An eclectic bunch then but the playing here is exemplary and their shows will offer a rare opportunity to see them live. Dates below. Crosby Tyler. The One Man Band Rebellion. Bohemia Music. LA based Crosby Tyler has proven his affinity for the American folk and blues tradition with his two previous releases, Ten Songs of America Today and Lectric Prayer. On these he was backed by some stellar musicians including Peter Case (who produced Ten Songs), DJ Bonebrake and members of Nickel Creek. The One Man Band Rebellion is exactly that, Tyler on guitar, bass drum and harmonica, a genuine one man band with all songs recorded in one take, no overdubs or studio gimmickry. As he says ” It seemed that nobody knew how to record direct, one-take style, as a one man band. The bass drum posed a problem for most modern day engineers.” Tyler credits producer/engineer Jamie Bridges for capturing the sound he wanted and it has to be said the sound is excellent capturing the old time roughness of spontaneous playing with a sparkling clarity while the bass drum/guitar/harp set up is perfect for Tyler’s hobo folksiness. The album itself continues Tyler’s mission to document and champion the underdogs, society’s cast offs be they junkies, bikers, hippies, white trash which was evident on Ten Songs. The language is raw (and not radio friendly) but it speaks of the streets with some arresting tales and images and the overall impression is similar to a collection of short stories in the tradition of Willy Vlautin with some Bukowski thrown in (up) for good measure. And while the subject matter might be downbeat the delivery is at times very up with slide driven acoustic blues and gospel tinged campfire songs sidling up against some very fine songs in the manner of Kristofferson and Guthrie. Tyler opens the album with the scrubbed country blues of Live Or Die featuring an escaped convict who “jumped barbed wire had myself a weekend/I drank tequila sang Johnny Cash tunes/I got my face on the six o’clock news” who’s sitting with a stick of dynamite waiting to die. Merle haggard and Willie Nelson get name checks as they’re playing on the jukebox in the one horse town Tyler rides into on Bikers, Hippies and Honky Tonkin’ Cowboys, a foot stomping portrait of the type of bar Thelma and Louise visited with the denizens described as “you can love them hate them but there ain’t no better crowd.” Red Cross Blues eases on the gas as Tyler fingerpicks his way through the sorry tale of a wounded vet returning home and worried how he’ll be able to face his child. It’s an impressive and affecting performance with a sense of anger hidden in the pathos. This unsentimental portrayal of hurt and damage continues in Us Black Sheep Ain’t Like The Others, a fine raw slice of drug addled lives where “our blood is hustlin’, dealin’, stealin’ and some days killing, Black sheep we ain’t like the others, we were born to be rowdy motherfuckers.” Their poverty is highlighted at the beginning of the song in the line “there ain’t no McDonalds here in Mendocino.” The bleakest moments come in the magnificent Bloody Mary Mornin’ Till I Die where Tyler applies Willie Nelson’s momentary sense of regret to an entire life as his character “is dogging from the law holed up in Little Rock, Arkansas/held up a 99 cent store/something that I drank made me so irate/almost put a granddaddy in his grave.” Unlike Nelson, who’s flying away from his regret, here we have a man who “just shaved my head/ laid all day in bed/watched Porky Pig cartoons” and who appears doomed, never to reach California as “the orange blossoms wither” and he’s stuck until he dies. Powerful stuff indeed. Tyler offers further snapshots of drug addled, booze ridden captives in Pissed It All Away, Never Trust a Junkie and It Ain’t Easy to Be Me with his voice wearied and road worn while his trusty guitar, drum and harp accompany this bleak roll call of America’s underbelly. All in all a great album. Getting into a folky mood after cuing up some albums tonight (Liege & Leif and the Albion Band’s Rise Up Like the Sun if you ask) so it was nice to recieve this video of Seth Lakeman performing his new single Last Rider from his latest album Word of Mouth. It’s a cracking driving performance. Seth will be playing at London’s Royal Albert Hall on 6 June as part of BBC Radio 2’s D-Day 70 Years On Concert where he will perform a song with the BBC Concert Orchestra. Rob Williams. A Place In The Sun. Just the job to shake the cobwebs from your head, Richmond VA’s Rob Williams delivers a fine set of rocking roots music on his solo debut A Place In The Sun. Sinewy and tough talking rock fronted by his thrashing acoustic guitar with a slight element of country thrown in for good measure Williams recalls folk such as Russ Tolman, Rhett Miller and the Old 97’s. With his studio band (sister, Leslie Williams (lead guitar), Hanby Carter (bass), Tom Beekman (keys), Miguel Urbiztando (drums), Al Weatherhead (electric guitar, keys, pedal steel), Bob Miller (trumpet), and Toby Whitaker (trombone)) well honed despite them not hearing the songs until they ventured into the studio they beat the daylights out of the opening song, Whiskey In The Morning, which throttles along like a semi truck with its brakes gone. Nothing Good is a snappy and almost classic example of pop like roots rock , its chunky chords and corkscrew guitar solos along with the radio friendly hook recalling John P. Strohm. Strange Way and Short Sighted continue in this fashion with the latter girded with a horn section that somewhat detracts from the song’s basic attraction. The country side of things is well served by When You’re Better with piano and pedal steel swelling as Sarah Brawley duets with Williams. What You Gave digs deeper into the countryside with elements of The Jayhawks embedded in its DNA. Fire Mountain. All Dies Down. This Is American Music. Blabber’n’Smoke got all fired up over Fire Mountain’s EP, Of The Dust, way back in 2011. Since then main man Perry brown has been posting demos via Facebook before launching a Kickstarter campaign for this album. Sadly there was a shortfall and for a while it looked as if the demos would have to suffice for the time being. A pleasant surprise then to find out that they’re the latest addition to This Is American Music‘s roster with their debut album All Dies Down. On the EP we compared them to Fleet Foxes but here they’ve taken some giant strides while expanding their scope with a chunkier, beefed up sound, the result being a fine collection of strained ballads and sparkling countrified jaunts. Singer and songwriter Perry Brown remains a fine singer with his voice a well stained husky instrument in itself while the band (Ryan Richburg, electric guitar, Walter Black, bass, Bryan Segraves, keyboards and Adam Vinson on percussion) whip up a fine storm on occasion. There’s a Springsteen like muscularity to some of the tunes with much of this down to the keyboards while the guitars alternately ripple or spark with some feedback fury thrown in. The album kicks off in fine fashion with Be Your Eyes, a fine mid tempo piece that recalls Whiskeytown, a perfect summer song with its rippling guitars and melodic joy. Anchor Iron weighs in with a whiff of Wilco circa Summerteeth and by now it’s apparent that as a band they have stepped up a pace with the arrangement here just short of wonderful. The rhythm section is taut while a tough guitar line chops across what appears to be a vibraphone as Brown sings with an almost hoarse weariness. The song bustles towards a busy middle eight before the choppy guitar and keyboards wind it down to the end, a great song and one that I reckon would please fans of Danny and The Champions Of The World. In fact there are times throughout the album when one can imagine Fire Mountain to be working at the same coal face as Danny and his Champs. Factory Line showcases the band’s new muscle with a guitar riff descended from Secret Agent Man that mutates into a churning country rock stew with added organ swirling throughout. Brown is ferocious as he spits out the words as the band pummel on. While it’s difficult to make out what the song is about it conjures up a neon lit strip peopled with hookers and full of danger. In any case it’s grade A Americana noir. Time for a breather with the gentle strum of At The Seams , a song that is gently energised by a softly propulsive bass and drums with rippling piano before it takes wings and flies. Doing Fine has a Stray Gators pulse beat with guitars shimmering in the background and an excellent piano solo as Brown paints a picture of ennui in a small town while Traces just about stumbles into view with a Stones’like woozy swagger, the beat just behind the guitars while Brown is joined on vocals by Janet Simpson-Templin. The outro here is majestic and does recall Jagger and Richards’ finer forays into the country genre. They cap it all with the final song, Moving Target, opening with Brown crooning over first acoustic and then electric guitar filigrees before the full band pitch in leading to an organ and feedback drenched climax. Tremendous. Hank Wangford and The Lost Cowboys. O2 ABC Glasgow. Thursday 15th May. With his fine new double album, Save Me The Waltz, safely in his saddlebag veteran Hank Wangford ambled into town with his posse, The Lost Cowboys, in tow looking to entertain the folks on Sauchiehall Street. Seriously this was a welcome return to Glasgow for Wangford who has roots in the city (which was his mother’s birthplace) with several audience members recalling fabled Mayfest community shows in the likes of Castlemilk Community Centre (although the primary recollection there was of the band having much of their gear nicked!). Tonight Wangford was backed by a stellar line up which included guitar and pedal steel wizards Martin Belmont (Ducks Deluxe, Graham Parker and The Rumour, Elvis Costello, Nick Lowe and Carlene Carter) and BJ Cole (Cochise, Deke Leonard’s Help Yourself and innumerable sessions including Elton John’s Tiny Dancer along with appearances with REM, David Gilmour and Iggy Pop). Rock history in person! Aided and abetted by drummer Roy Dodds (ex Fairground Attraction) and bassist/harmony singer Anna (Spanner) Robinson (The Hallelujah Trails) the five piece set up was at times magnificent with Dodds and Robinson setting the pace with some aplomb while Belmont and Cole showed why they are so sought after as throughout the night they pulled out some astonishing licks. Aside from the sheer pleasure of hearing some top notch musicians doing what they do best Wangford remains a singularly good frontman. Wearing his years very well (and looking as if he could well take up Kris Kristofferson’s Hollywood role as the wise and grizzled cowpoke should Kris ever retire) he commanded attention as he related his love of the country waltz and offered potted histories of some of the legends who wrote the songs including the unfortunately named Bollick Brothers who eventually saw sense and renamed themselves the Blue Sky Boys, as Hank said “you don’t have to make this up, it’s all out there.” With particular attention to Willie Nelson and George Jones, Wangford proselytised on their behalf and as the songs poured out the attraction was plain to see. Nelson’s Permanently Lonely and Half A Man along with Jones’ Brown To Blue and Golden Rings were well served while the essential banality of song titles such as He Forgot To Tell You He Was Married and Let’s Be Lonely Together Tonight was undermined by the heartfelt delivery. Mischievous as ever Wangford delighted in picking up his ukulele and teaching the audience the choruses of several of the songs pointing out their simplicity all the while celebrating that self same simplicity. The audience duly sang along as the sorrowful waltz time songs surely invited some tears in beers in the back rows. With some fine low strung twang guitar and country runs along with weeping pedal steel or Dobro the venue was slowly transformed into a south west honky tonk. Ms. Robinson took lead vocals on the excellent Insured Beyond The Grave while Cole was afforded the opportunity to beguile us with an inspired dreamlike rendition of Santo and Johnny’s Sleepwalk , a tune that inspired him (along with Peter Green) all those years ago. And while most of the night was an invite to waltz with Wangford there were some moments when the band let rip with Baby In Black conjoining Nashville and Liverpool while He Forgot To Tell You He Was Married rocked with the energy and feel of Commander Cody’s Lost Planet Airmen. A magnificent night.